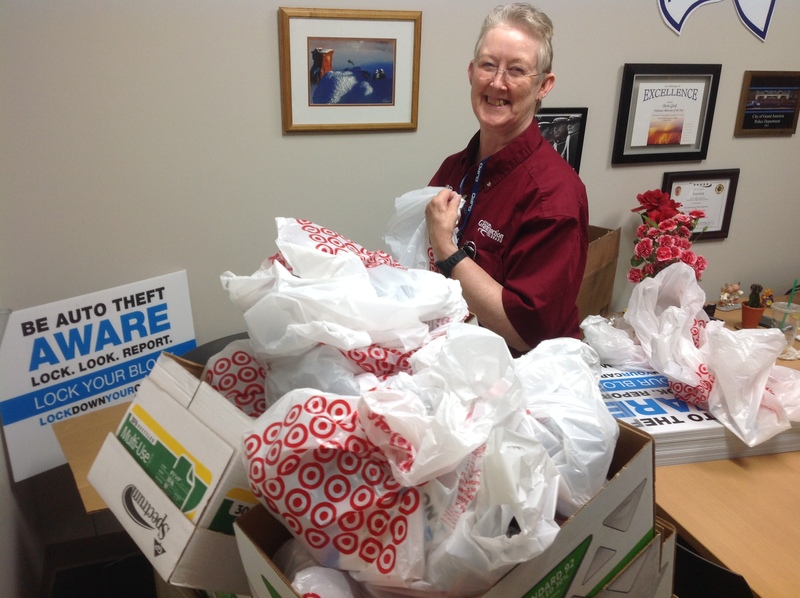 GJPD Volunteer Linda is filling bags with important safety information for residents and fun goodies for the kids. Officers will distribute the bags to neighborhoods during National Night Out. More than 20 neighborhoods across Grand Junction are hosting National Night Out events tonight (August 5, 2014). Find out if your neighborhood is sponsoring an event using this link. All of the events take place this evening, but the individual neighborhoods each have their own start times. National Night Out is an annual event that helps fight crime in our neighborhoods by building camaraderie and familiarity between neighbors, while also sending a message to criminals that their neighborhoods are willing to fight back against crime. All Grand Junction neighborhoods who registered their National Night Out events with the Grand Junction Police Department will have an officer stop by and visit them during the event to provide safety information and answer questions. We also have bags of goodies to hand out to the kids! If your neighborhood is having an event tonight, we’d love to share your photos on our social media sites. Email them to gjpd@gjcity.org. This entry was posted in GJPD News and tagged national night out.